​14 tracks: The Street O’ Sorrows * Bonnie Meg * The Guid Auld Trams * Doon Pinkie Cleugh * The Herring Road (part 1) * The Brig Tae Nae Where * The Herring Road (part 2) * Star O’ The East * A Summer Tale * The Herring Road (part 3) * My Luv’ Is Like A Red, Red Rose * The Shoals O’ Herring * We’ve Lost A Lark * The Toun O’ Prestonpans. 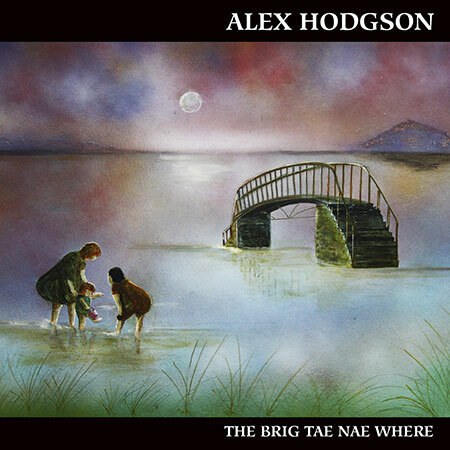 The Brig Tae Nae Where (The Bridge To Nowhere) is the second Greentrax album by the Prestonpans singer Alex Hodgson. Twelve tracks on this album were written by Alex, plus one each by Robert Burns and Ewan MacColl. This new album is based on family memories of summer days past, some spent at Belhaven Bay near Dunbar. It takes a different approach from his debut album and touches on a nautical theme which weaves its spell through traditional and original material. His previous album Jeelie Jars ‘n’ Coalie Backies was released in 2010 and received fabulous reviews and attention globally, whilst also making its way into The Queen’s own music collection. Born, raised and still residing in Prestonpans, East Lothian, it’s no wonder Alex’s songwriting has been influenced by his surroundings. Just a stone’s throw away from the famous Jacobite battlefield, along with the many other captivating landmarks around East Lothian, he has never been short of inspiration. Full to the brim with stories, history and myths, his fascination of his home town’s past has been captured and shared with us in his poignant song writing capabilities. Alex achieved high acclaim on the folk stage as a Scottish singer/songwriter after twice winning Burnsong, an international competition held to celebrate the art and power behind composing a song. The competition also led him to represent Scotland in Toronto, Canada, at Folk Alliance 2012, within a new band named Kilmarnock Edition which is made up entirely of Burnsong contestants, including the fine Gaelic singer Fiona J Mackenzie. Alex is a hugely popular singer and entertainer in Scotland and has on several occasions sung for the Queen at Balmoral Castle. He has also sung at the Scottish Parliament, on BBC Radio Scotland and further afield in South Africa and Malaysia. He has appeared in many amateur stage presentations and also has a great interest in storytelling. An all-round professional with a huge following, particularly in lowland Scotland. The eye-catching front cover painting is by Alex himself.